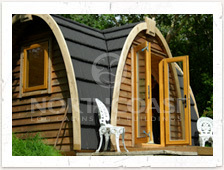 The Camping Snug is a fantastic new cabin that is delivered fully assembled ready for use. If you own a campsite see how you can start earning money with our Camping Snugs. 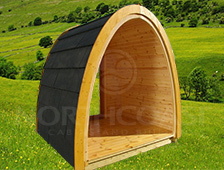 The Camping Snug is perfect for adding a summerhouse to your garden. It's a great playroom for the kids, and the perfect place for them to camp close to home. The perfect garden office, writing room or retreat from the home. The Camping Snug can be easily turned into a warm and cosy environment for pleasure or work. 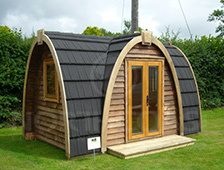 The Camping Snug is a fantastic rental option for campsites and holiday homes. Installation is quick and easy. Read about how quickly you can reach a return. The interior is easy to adapt to suit your rental needs. 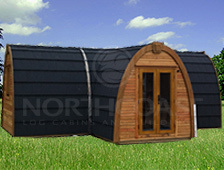 We supply the Camping Snug Star Pod already fitted with pipework and conduit for cables. We can also supply beds, the kitchen and bathroom. The highest quality materials and techniques are used to build the Snug. 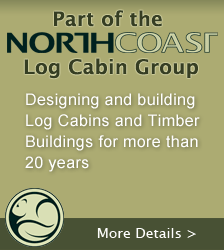 Secure double glazed doors and windows, high quality timbers and boards. The Camping Snug comes pre-assembled and ready for use. You just need to prepare the base. The Snug is so versatile. Whether it be to replace tent rental on your campsite, the ultimate glamping option, site offices or fishing huts. 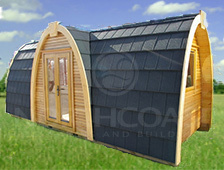 The Snug is available in three different sizes, with additional extensions also available. We supply the Snug ready for you to finish to your requirements, or we can supply with kitchen, bathroom, double bed and singles beds already fitted. 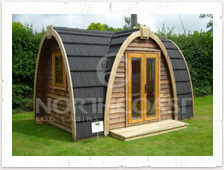 The Standard 4m Snug is perfect for individuals or couples, kids playrooms and summerhouses. The Large 6m Camping Snug has enough room for 2 beds, making it ideal for sharing. The Camping Snug Star Pod is big enough for a whole family to stay in. It comes complete with beds, pipework and conduit for cables. Snug Extensions are available so that you can customise each building to meet your needs. No Tent To Put Up! The Camping Snug takes the trauma out of camping... Camping Snugs are an eco-friendly alternative to camping. They are also more secure than camping as they have lockable doors. The roof is insulated with multi foil insulation making Camping Snugs practical whatever the weather! The Camping Snugs have loads of headroom and are able to sleep four. Bring everything you need for camping, minus the tent. 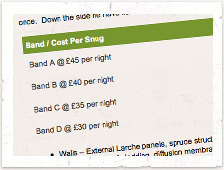 We offer lease finance options on all our Camping Snugs. Call our Sales Dept on 01208 850376 for further information. 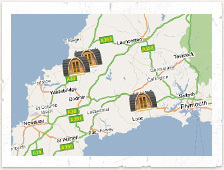 Images of Camping Snugs at various locations around the UK. What is a Camping Snug? How big is it? What is it made of? How much is it? See how easy it is to make money with The Camping Snug. Where are they? How do I get there? Our interactive map has all the info you need.